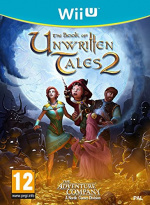 Nordic Games' The Book of Unwritten Tales 2 revisits the point-and-click adventure glory days known for titles such as Monkey Island and Simon the Sorceror. Although there are still some great adventure games out there, not many arrive on console (and even less on the Wii U), so it's always exciting to see how these titles play out. Although this game is a sequel you don't necessarily have to have played the first one, either, as it's fairly easy to catch on. The Book of Unwritten Tales 2 sees you play as different characters throughout the game – Ivo the elf princess, Wilbur the gnome and Nate the - erm - human as they embark on an adventure to save the land of Avantasia from evil. You are thrown in straight away, taking on the role of Nate as he freefalls through the air. The introductory sequence and tutorial that follows are cleverly done and certainly useful, preparing us for the story to begin. You start in earnest as rebellious Ivo who is locked in her Elven home to avoid not only a strange epidemic, but her mother who is putting the pressure on for an arranged marriage. 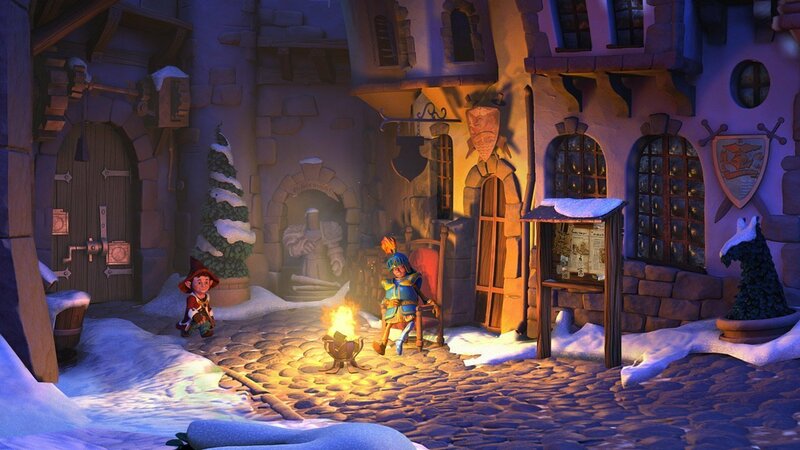 Although not entirely original in its fantasy tropes including elves, gnomes, wizards and so on, the game draws you into the story using its humour and cultural references to other adventure franchises. The dialogue is clever and funny, with the characters breaking down the wall between them and the player every so often. References start early with Game of Thrones and continue throughout including Minecraft, Monsters Inc. and many others. The references are for the most part cleverly placed, though a few are just thrown in with seemingly no context or thought, and this can let the game down at times. 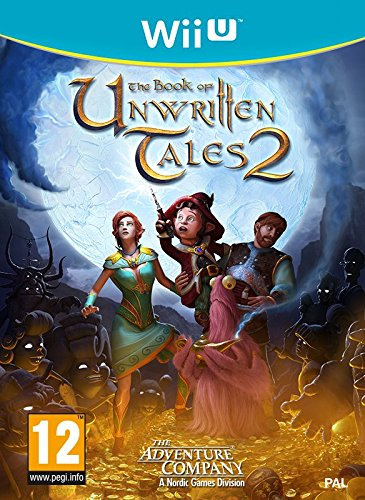 The Book of Unwritten Tales 2 still maintains a good level of comedy even without its many references, and the writing in general is definitely one of its strengths. Unfortunately, the comedy is sometimes broken up with very long dialogue sections which had us tempted to press the 'skip' button. Voice acting is mainly good with the odd blip; some characters are more fluid and believable than others, but overall they're fine for an adventure game and the weak ones don't taint the experience. 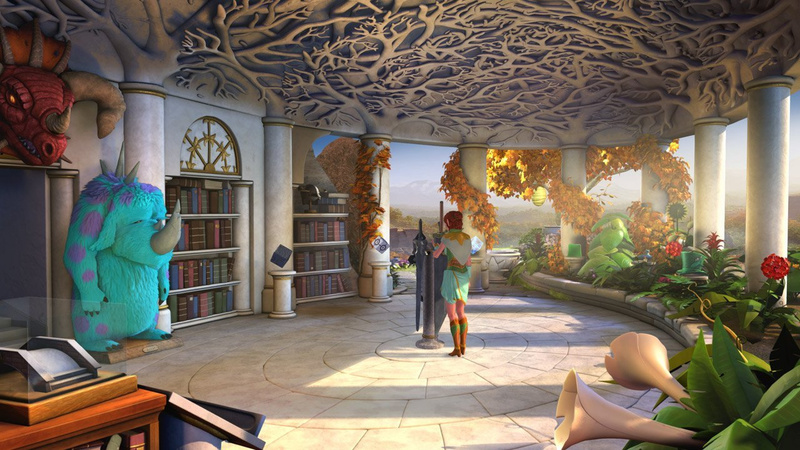 The puzzles in The Book of Unwritten Tales 2 are mostly logical, with the occasional instance seeming a bit out of place or poorly explained. Like most adventure games, talking to the characters will mostly give you a good hint in the right direction but sometimes you will be wandering around for a good while before you solve your dilemma. The main issue with the puzzles, for us, was the clunky way of interacting with items. In order to interact with something it must be highlighted, but this system is not very intuitive on a console and you can end up repeatedly interacting with the wrong thing or unwittingly bashing into items. 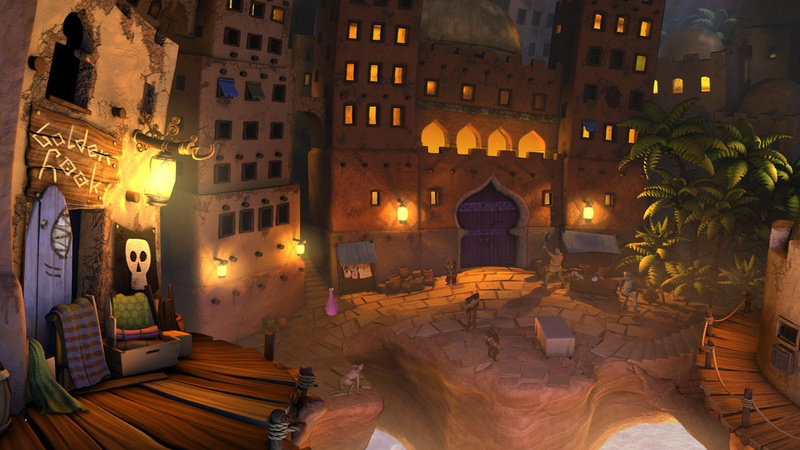 The puzzles also require a lot of travelling between screens, with a fast travel option only available in some areas. Small user interface issues are easily found, such as the requirement to double click to exit a zone; it would have been a lot more comfortable to simply walk and let the screen move intuitively. Once unlocked, you can switch between characters to complete a puzzle (think Day of the Tentacle style) which means if you get stuck with one character you can switch to the other and see if they fare any better. The GamePad is largely dormant in this title; the only function is to switch screens between your TV and controller. This is a shame as the touchscreen is just screaming out to be used for adventure titles, particularly in this case for an inventory or map. The settings option on the menu allows you to tweak graphical ares alongside the volume of the speech, sound and music. This is particularly handy as sometimes the characters are barely audible so you can tweak it to get the best experience. 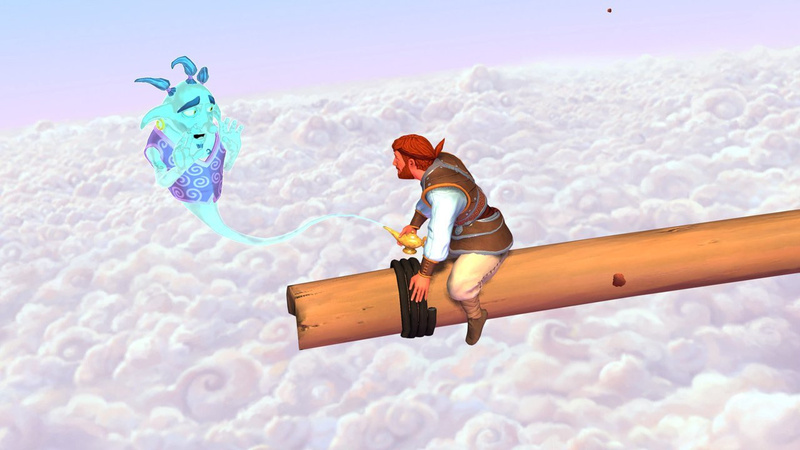 Graphically, the game is strong with Pixar-esque detail and stunning backgrounds which suit both the story and characters well; the only downside is that the on-screen text is sometimes tricky to read. The various locations allow the graphics to really shine and match the mood well, ranging from the very bright and colourful to the dark and dingy. The Book of Unwritten Tales 2 on Wii U does suffer from some glitches. The audio is a pleasant classical soundtrack, but the volume suffers from drastic changes whenever it feels like it and sometimes just cuts out altogether. The game tends to freeze up on occasion, and there was one glitch which saw us having to quit the game altogether as we were not able to save. Glitches are always frustrating and will take away from your user experience - these are no different. It takes around 20 hours to complete the main story, but depending on how tricky you find the puzzles it can be much longer. At a budget retail price it offers enough in terms of gameplay, humour and presentation to be worth the price, but just be aware of the dreaded glitches! I bought the physical version on Wii U but haven't had a chance to play it yet. I'm disappointed to see it didn't score higher. Hopefully Nordic Games will release a patch to fix the glitches. When looking at PC, it averages 80%, there isn't a Wii U Metacritic score unfortunately. Nice review. It seems if there wasn't any glitches it would have scored a point higher. If you were able to use the stylus and touchscreen for the pointing and clicking then possibly even more.We should have loads of these kind of games on Wii U,it's one of the most obvious genres that suits the Gamepad but other than this one I can't think of any?I'll pick it up when I see it on sale ,hopefully the glitches will have been patched by then. I LOVE old school adventure P&C games. King's Quest V is one of my favorite games of all time. This is very tempting! Freezing? I hate that! Might buy it someday, but only after some patches. Just a warning to everyone. At the moment the game is practically not playable, because of the save glitch. It is something that everyone seems to encounter after playing through to a specific point in the story. After that the autosave stops functioning and you are not able to save manually. I've contacted Nordic Games about it and have yet to hear back from them. Because of that, I have not yet delivered my own review. I would have to give it a 1/5, due to not being able to complete the game in the current state, and I was hoping they would be able to fix it quickly, so I could give the game the score it really deserves. It is a really great point and click adventure with lots of references to pop culture, and that is how I would love to be able to grade it..
One thing in its favour is that it does not use the Gamepad. Even after all this time reviewers don't get it, you can't look at the TV and then to the gamepad and back again, it does not work. If you mean play the game totally on the Gamepad, then it is NOT a Wii U game. @Captain_Gonru Yep ,the best example I can think of was Zak & Wiki,but that was from Capcom. I would love to see something like that with a Nintendo twist.When I first saw the Gamepad,point and click adventures and games like Advance Wars ,Sim City ,Civilisation etc were the first kind of games I thought would be perfect for it but we haven't seen anything like them really. That's 3 popular genres that could have really set the Wii U apart but alas. I don't know if that's a widely accepted term, but even though this release may have some issues, it's nice to see smaller publishers putting out smaller budget physical releases again. Maybe people are just fatigued from the Call of Duty, Assassin's Creed, Battlefield, etc... sequels offering little innovation or variety for all their marketing, but at the start of this gen it looked like everyone that wasn't the size of Activision, Ubisoft, or EA was going away. I hope this trend continues. I tend to stay away from the over-hyped, overly generic, big budget, fodder from the big western devs. It's one of the reasons I like Nintendo and their unique approach to console gaming. @jimi Wii U use the gamepad for inventory and it works perfectly. Yes. But others games don't use a gamepad and they work just as perfectly as well. I've not played this yet but looks awesome and review scores ain't too bad either. Very interested. It may not be the Zack and Wiki sequel I've given up on waiting for, but I am interested. The Monsters Inc reference is quite... Obvious. I got this and haven't played it yet. I love the old point-and-click games, and I'm a little disappointed the gamepad isn't utilized like I'd imagined. But I am happy Nordic is taking some initiative to bring games to the Wii U (Legend of Kay, Books of Unwritten Tales and they've recently confirmed that they're working on another game for the system right now). Honestly, these types of point-and-click games, RTS/TBS games and world building type games seem like the logical fit for the Wii U gamepad and for some reason nobody is doing them. I mean, genres that have previously been pretty much exclusive to the PC or just better on the PC could have translated well to a console for once. I had seen this game pop up a few times on PS4 shelves and I was intrigued, though ultimately walked away as I didn't know what it was, or why I'd never heard of the first game. I like point and click adventures, so my selling point has to meet a balance of good price and amount of moon logic. If I need to print out a walkthrough to get ANYWHERE, I won't waste my time. @zool Perhaps technically, but they work even better functionally when the inventory is on the GamePad. I can understand your concerns with something like "Star Fox Zero" (although plenty of players still enjoy its controls), but there are plenty of genres where something like the GamePad enhances the experience. It's just a shame that Wii U developers don't think to use it properly (or the Wiimote/Nunchuck) a bunch of the time. As others have mentioned, there is a game-breaking bug in the game that prevents you from saving after a certain point. I can't believe Nordic Games hasn't released a patch yet, or even acknowledged this problem, which makes the game unplayable. Nintendo Life, can you get an answer from Nordic Games? @Captain_Gonru Or looked at another way, it's a market other developers could have pursued and fostered on the Wii. Nintendo shouldn't be expected to know what niche gameplay style will bolster them, nor can it and shouldn't be scolded for it. Perhaps its a negative on Nintendo's part at this point in the game believing developers are willing to spend resources to pursue unique gameplay ideas. I think that expectation set sail with strong competition making that ideology not so attractive for developers anymore. I bought the physical dic and I've played it a little. My main issue are the horrible loading times between areas. On their own they're not TOO bad, but they add up quick and it's gotten to the point where I'm loathe to leave an area unless I absolutely have to. I had no clue this existed. I don't own a WiiU unfortunately. Its nice to see this 'dead' genre come back to life. Can't wait for starr mazer, the next space quest-esk'. Has this been patched yet? I was thinking of picking it up soon. @Miiamoto No it has not been patched, yesterday I started it and play for around 5 hours only to find out about the save glitch. I lost at least an hour of gameplay, I'm not sure if I'm going to replay that and continue . Just came online to see if I find some info about it. BTW the sound goes muted every so often and it is quite annoying. I wont mind any of the improvements people talk about (gamepad integration or wiimote). The issue is that is has not been ported properly just for basic play. The load screens take ages, sound going off all the time and unable to save: basically means the game is broken and unplayable. I'm very disappointed. @elstif Thanks for the info. I guess I'll be ignoring this one then - such a shame.